The landscaping on commercial sites may be low on a business owner’s list of priorities for their property. But you should not underestimate the positive influence an attractive landscape can have on potential clients. With this in mind, here is a list of ten issues to consider for choosing the right plants to keep your property’s landscaping looking and functioning at its best. Nobody wants to spend extra money or time dealing with or replacing diseased or dying plants. Avoid choosing plants that are easily susceptible to attack from disease or pests. Along the same lines of replacing diseased plants prematurely, nobody wants to spend time and money replacing plants that live short lives. The cost of purchasing and installing landscape plants is significant, so it is wise to choose plants that will stand the test of time. The location you are planting on your property may currently be in any degree of exposure from full sun to full shade. But conditions may change in the near future. Will a new building or new trees be placed on the neighboring property? Conversely is a structure or tree slated to come down, creating a new pocket of full sun? Picking plants with higher adaptability to various exposures will ensure success for your landscape. The soils in my area are typically heavy in clay with a high (alkaline) pH. This is one more challenge to add to the list of issues that face landscape plants. For best success and longevity, choose plants adapted or adaptable to the soil conditions on your property. You may be familiar with desert plants and you may be familiar with rainforest plants. These two extremes of ecology illustrate the wide variability of climate that plants live in. Your landscape likely falls somewhere in between these extremes. However, even in the most average commercial landscape, we might find wide degrees of moisture and irrigation levels. Having plants that can handle these extremes will help ensure your landscapes do well. 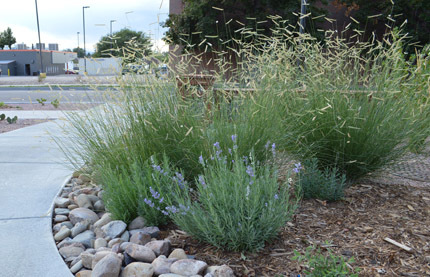 Although nearly all municipalities require automatic landscape irrigation, it is good if the plants you specify for a site are truly drought tolerant. But on the flip side, some plants that are considered very low water plants may be more difficult to establish on a commercial site due to over watering. Many but not all native plants fall in this category. They are more fussy about soils and drainage. They may need to be ruled out of the “set it, and forget it” situation that many commercial clients may seek. But if you have the time or the staff to work with some very low water plants during their establishment time, they can eventually become great components of your drought tolerant landscaping. The easiest plants to use in your landscape will be adaptable to varying soil moisture levels. 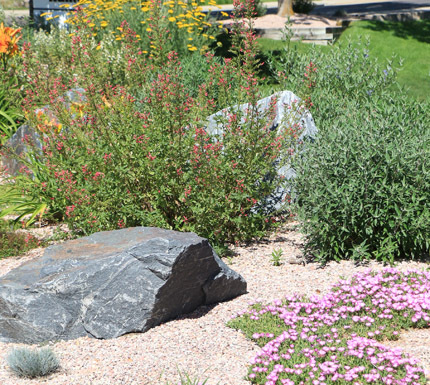 A variety of perennials and shrubs adapted to Colorado’s climate. Your maintenance crew has enough on their plate with regular landscape maintenance. There’s no reason to increase their burden and your costs by having messy, difficult plants on your property. If you lose some of your landscape plants due to accidents, vandalism or bad weather, you will likely want to easily replace the missing vegetation. If the plant that needs to be replaced is hard to find, you might have to resort to replacing it with one that does not match. Attract eyeballs and attention to your business by choosing interesting trees, shrubs and flowering plants. Just as having aesthetically pleasing buildings or signage is good for business, eye-catching vegetation and other landscape elements makes good business sense. Choose Trees and shrubs with notable flowers or good fall color. 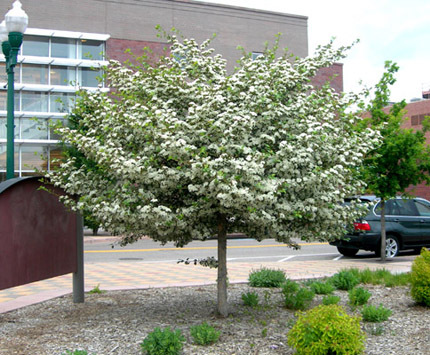 A Hawthorne tree in spring bloom. If you are planning a new commercial landscape or taking an assessment of your existing commercial landscape, keep these guidelines in mind. They’ll help you avoid potential problems that might repel clients and customers from your property, rather than inviting them in. An inviting landscape on your commercial property is one of the first steps to achieving business success. I like what this article mentions about choosing plants that are easy to maintain, and are adaptable to different environments. I am redesigning my commercial landscaping, and I think choosing plants that will survive in all sorts of different weather conditions with little maintenance would be perfect. I’ll definitely have to talk to the contractor about what might be the best choices, especially for my areas weather patterns. A good friend of mine is going to be landscaping his business, and I’ve decided to help him pick which plants to use. I’ve never done any landscaping before, though, so I’m happy that I found your post! I really liked your tips, especially what you mentioned about picking plants that are drought tolerant. We live in a hot area, so having plants who can withstand the heat will be perfect! I’ll be sure to keep this in mind while I look. Thank you for the advice!